Pictured above are members of the 2019 Cardington-Lincoln High School Winter Sports Night court. Back row (l-r): freshman attendant Karsyn Edwards, senior king candidate Logan Doubikin, sophomore attendant Camrie Meyers, senior king candidate Devin Speck, junior attendant Elizabeth Horton and senior king candidate Branden Steckel. Front row: senior queen candidates Delisa Goodman, Kynlee Edwards and Brianna McConnell. Pictured above are the first grade students serving as the junior court members. 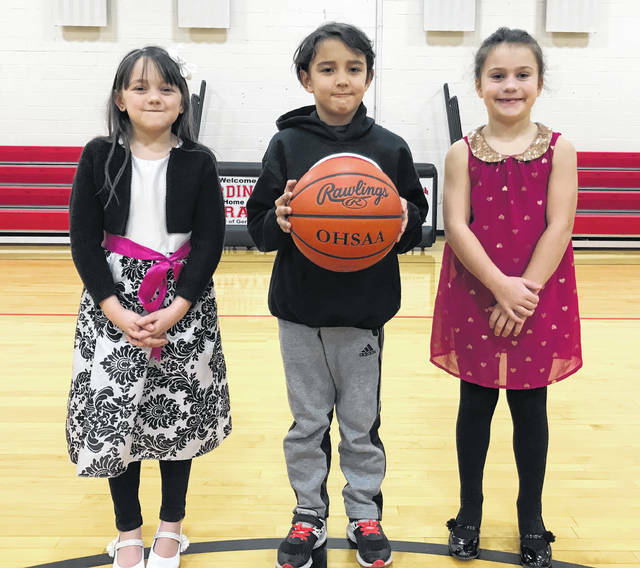 From left to right are Makynzie Boggs, Sawyer Ongalibang and Brooklyn Denney. 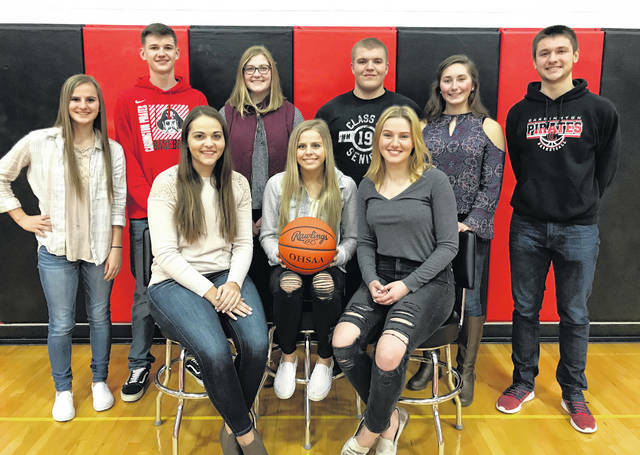 Cardington-Lincoln High School will celebrate Winter Sports Night on Friday, Jan. 25, when the crowning of the new king and queen will take place between the reserve and varsity basketball games played with visiting Northmor High School. Following the game a dance will be held from 9 to 11:30 pm with John Brehm as DJ. Admission is $3. Queen candidates, all seniors, are Delisa Goodman, Kynlee Edwards and Brianna McConnell. King candidates, also seniors, are Logan Doubikin, Deven Speck and Branden Steckel. Class representatives are Elizabeth Horton, junior; Camrie Meyers, sophomore and Karysn Edwards, freshman. Junior court members, all first grade students, are Brooklyn Denney, daughter of Joe and Jodie Denney, who will carry the queen’s crown; Makynzie Boggs, daughter of Christina Boggs and Damon Boggs, carrying the queen’s flowers and Sawyer Ongalibang, son of Mike and Angie Ongalibang, who will carry the king’s scepter and medallion. Crowning the new king and queen will be the 2018 royal couple Rylie Partlow and Mayson Martin. Kynlee Edwards, 18, is the daughter of Jamie and Charity Edwards and will be escorted by Branden Steckel, son of Denise Radcliffe and Brad Steckel. She has been active in AAU basketball; Spanish Club and varsity basketball. Her basketball honors include the Archie Griffin Award recipient; All-Ohio honorable mention; twice named to first team All-Central District; twice named first team All-District 11; second team All-Central District; second team All-District 11; a three time all-conference selection; varsity basketball team captain; three year varsity basketball letter winner; and two time defensive player of the year. She has accepted a full athletic scholarship to play basketball at the University of Findlay. Steckel, 18, is active with FFA, NHS, football and basketball with honors and being named to first team KMAC; first team all-central district and special teams all-Ohio; He received the Archie Griffin Award and the MOAC Scholar Athlete. Delisa, 17, is the daughter of Lynn and Diane Goodman and will be escorted by Deven Speck, son of Jeremy and Rachel Clark and Mark Speck. She is president of the Cardington FFA; secretary of the Shaw Creek Farmers 4-H Club and of the high school student council. She is also secretary of the National Honor Society and is assisting leader and acolyte at St. Paul Lutheran Church. Her 4-H activities include being named the Morrow County Junior Fair Queen and earning the champion rate of gain with a market steer both in 2018. In FFA she was junior high point award member, reserve champion high point member, top fruit and strawberry sales person and she received her state degree all in 2018. Deven, 17, has been active in football, wrestling and FFA. His football awards in 2017 include KMAC second team defense; Dog Soldier Award; NCOFCA Honorable Mention; All Central District honorable mention; varsity football and wrestling letterman in 2015 and in 2016 he won the Grand and Reserve champion market rabbit. Brianna McConnell, 17, is the daughter of Jennifer and Terry McConnell and will be escorted by Logan Doubikin, son of Brett and Candida Doubikin. She is a member of the National Honor Society, yearbook staff, Drama Club treasurer; May Day president; and merchandising/styling specialist. Doubikin, 18, is a lifelong member of Richland Road Church of Christ in Marion; an 11 year member of the Free 4-All 4-H and a camp counselor in 4-H. He is a four member of FFA played basketball eight years; a golf team member four years and a baseball team member for three years. He raises poultry and earned Grand Champion in 2018 at the Morrow County Fair. He has enlisted in the U. S. Marine Corps and will begin his service following graduation. Junior attendant Horton, 16, is the daughter of Aaron and Mandy Horton. She plays softball, traveling softball and is a member of the FFA and the Prom Committee. She has also earned honors on the Honor Roll. She will be escorted by Josh Shook, son of Greg and Missy Shook. Sophomore attendant Meyers, 15, will be escorted by Mason White, son of Travis and Tabitha White. She plays volleyball and was captain of the 2018 JV volleyball team; assistant secretary of the 2018-19 officer team and earned an academic letter. She also belongs to the Spanish Club, Spirit Club and the FFA Chapter. Edwards, 15, daughter of Jamie and Charity Edwards, is the freshman attendant and will be escorted by Nate Hickman, son of Dave and Sarah Hickman. She is active with FCCLA and belongs to Free 4 All 4-H Club; plays on the JV and varsity girls’ basketball teams; and is a member of the Team Huddle AAU Basketball program. She is in the All Honors Classes and currently obtains a GPA of 4.7. All Winter sports night activities are sponsored by the Spirit Club.